Snow » Roger Perron Inc. Going into the construction of my new home, I heard many horror stories about working with contractors. Peoples’ advice to me was “be sure you get a good contractor.” I did just that. Roger and his team were simply awesome. Roger’s sub-contractors were great. Their work was timely and of good quality. 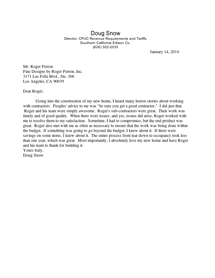 When there were issues, and yes, issues did arise, Roger worked with me to resolve them to my satisfaction. Sometime, I had to compromise, but the end product was great. Roger also met with me as often as necessary to ensure that the work was being done within the budget. If something was going to go beyond the budget, I knew about it. If there were savings on some items, I knew about it. The entire process from tear down to occupancy took less than one year, which was great. Most importantly, I absolutely love my new home and have Roger and his team to thank for building it.